As I write this I am enjoying some extremely tasty leftover soup that Clare made last Sunday. It kind of has everything in it, but I think that the swiss chard and the spelt are the most distinctive parts. She had bought some swiss chard at Trader Joe’s (on sale I think), and wanted to make something with it, but didn’t know what. I had seen several recipes in my new Italian cookbook calling for swiss chard, so I suggested she use one of those for inspiration. Clare is not much into following recipes, but she was nice enough to humor me. There was a recipe in the cookbook for some sort of soup with swiss chard, so she used that as a jumping off point. That recipe did not include spelt though. For those who don’t know, spelt is an ancient cousin of wheat (plants have cousins, you say? — sure, why not). You can make spelt into flour as use it for making bread, or you can use the whole berries. Some people who are allergic to wheat can tolerate spelt. 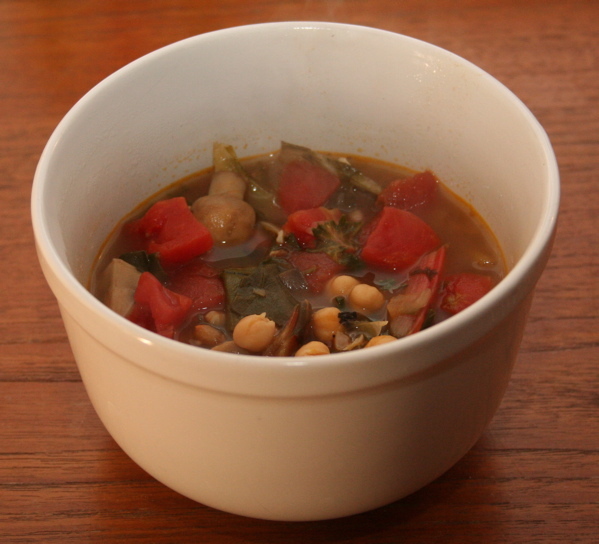 Anyways, the soup consisted of onions, mushrooms, canned tomatoes, swiss chard, chickpeas, spelt, and vegetable broth. As we sat down to taste it, we both felt it was missing something — RedHot did the trick. The slogan on the bottle is really true. It does add flavor, not just heat. So there you have it, a complete, healthy meal in a bowl. Spelt provides some good fiber and starch. Swiss chard provides calcium, iron, and other vitamins and minerals. 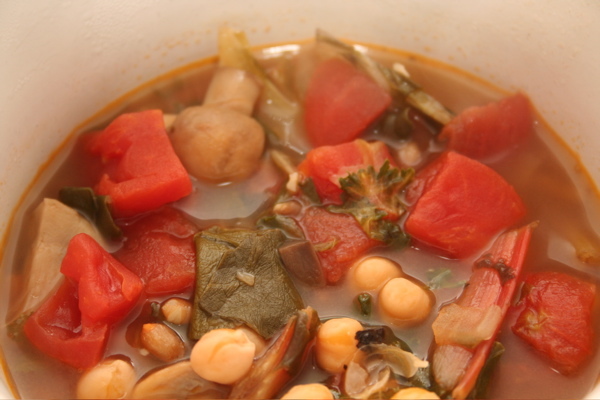 Chickpeas provide protein, and RedHot adds some flavor. I’m looking forward to a repeat.